I learned about hair analysis from my first human holistic physician. She ran them regularly on me (every 3 months) and said it could tell her a great deal about my trace mineral and heavy metal levels. She said that a blood test wouldn’t show heavy metals and was just a snapshot in time anyway. She had done hundreds of human autopsies and considers a hair analysis as the best “forensic” tool to look at what she might see in an autopsy without having to open her patients up. The biggest anomaly she found in me, for example, was aluminum toxicity. That seems to be very common in humans and animals on this planet. I stopped using deodorants with aluminum chlorhydrate at her recommendation, and got rid of aluminum cookware. Aluminum is a serious issue because it can take the place of calcium, manganese and magnesium. So no matter how much we take as supplements, aluminum takes the spots where those minerals are supposed to do their work and cause us to leach calcium out of our bones, causing osteopenia and osteoporosis in humans, for example. I started running hair analyses on my dogs in 2012. They had been on what I thought was a high quality, balanced raw diet supplemented with Wholistic Canine Complete for the previous year. The results were nothing short of shocking. All of my dogs had chronic heavy metal toxicity, and iron was so low that they could be considered clinically anemic. They also had serious mineral and potassium deficiencies and Dr. Dodd was concerned about the potential for heart attacks (even though all of my boxers had annual 24 hour holters and multiple echos that were all clear and had been cleared by board certified cardiologists.) Of all of the things that were in the analysis, nothing was within proper range. They had toxic levels of aluminum, selenium, lead, mercury, cadmium and arsenic. Aluminum was the worst. Ginger was showing joint pain at only 5 years of age, and Dr. Dodd said it was primarily related to these imbalances. I muscle tested for every supplement I could find. I did lots of Internet research and kept looking for the answer to this question – “What is THE BEST supplement for each dog?” I never could find any all-in-one supplement that tested as BEST. When GreenMin (trace mineral supplement) and SoulFood (the only organic canine whole food vitamin) hit the market, I tested those and finally got a “YES” to my question. So I started feeding those at the amounts they muscle tested for on a daily basis. They didn’t always need them every day, but even if I didn’t know how to muscle test, I would have fed them according to directions six days a week. I also did liver detoxes every six months using Livton (there are other things that also work like milk thistle), and had used some Chinese herbs that my veterinary acupuncturist recommended called “Liver Happy”. This was to work on detoxing the metals. But GreenMin also has chlorophyll in it, and that’s good for detoxing heavy metals and toxins as well. 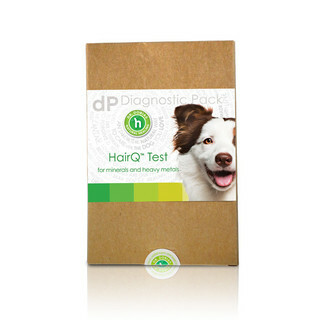 I’ve run these hair tests several times and now my dogs are pretty much in range on all their trace minerals and the heavy metal loads have gone way down, especially aluminum. Ginger no longer shows joint pain at the age of 7 ½, and I’m pretty sure that balancing out her diet was the primary factor. She’s now doing agility and just earned her first lure coursing title with the gusto of a very young dog. Dr. Dodd passed away in 2013, so I’ve been running my hair analyses through Dr. Dobias. I think they’re a fantastic tool to help balance out a pet’s diet. There are so many supplements on the market, and it’s difficult to choose how to wisely spend my money on them. The tests help to satisfy my scientific brain to know I’m doing the best for them and not wasting my limited budget on the wrong supplements. Ginger no longer has joint pain - her orthopedist is surprised!